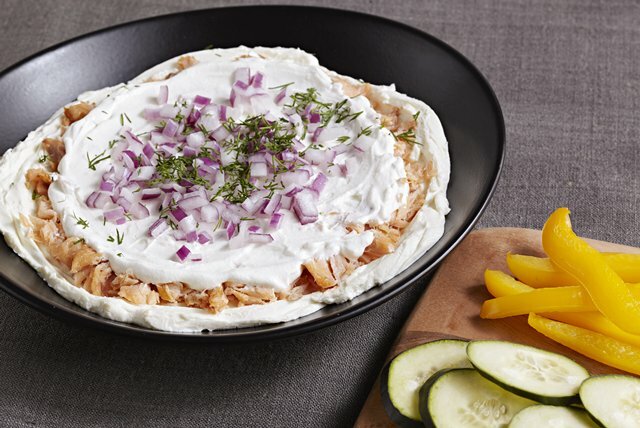 Try our no-bake PHILADELPHIA Smoked Salmon and Cream Cheese Dip for a quick appetizer! Two easy steps and this smoked salmon and cream cheese dip is ready. This great-tasting dip is sure to be a welcome addition to any brunch buffet. Serve with fresh veggie dippers, such as cucumber slices or bell pepper strips, or with your favorite crackers. Prepare using PHILADELPHIA Neufchatel Cheese, and BREAKSTONE'S Reduced Fat or KNUDSEN Light Sour Cream.